When Jesus heals a woman on the Sabbath Day, His act of love and mercy reveals the deep spiritual poverty of others whose hearts are gripped by mere rule keeping. 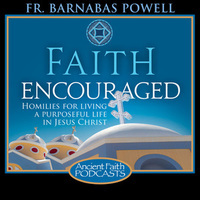 This revelation is an invitation to you and me to examine our own attitudes towards our faith! Have you ever raised children? I’ve discovered something raising children, children are like me or maybe I’m like children. Quick to desire and slow to learn. I never will forget, the first time I had to pop Catherine on the leg when she was misbehaving. It was horrible. By the way I never understood what my mother meant when she said, “This is going to hurt me more than it’s going to hurt you”, until I had kids of my own. Just a little pop on the leg just to get attention and it did! Her eyes got this big around. And she looked at me, incredulous, like complete shock on her face. He hit me! But it was amazing at how well she listened after that, all of her faculties were at complete attention. She was paying attention to everything I said, everything I did. She did not want what had just happened to occur again and it is amazing to me precious friends, especially as you find yourself as a leader of people. How do you motivate folks? How do you turn folks in the right direction in their life? Can you even do that? Is that even possible? And as I’ve learned and as I’ve studied and as I’ve prayed and as I have tried to grow up a little bit, I have begun to understand what the Scriptures meant when it said, “We are called exhort one another.” I love the word exhort. The word exhort is a fascinating word, it doesn’t mean cajole, it doesn’t mean beat over the head, it doesn’t mean shame; “you naughty, naughty person.” It doesn’t mean emotional manipulation. It doesn’t mean a guilt trip. It means to rouse to awareness because you see brothers and sisters, none of us will ever make sufficient changes in our lives, none of us will ever make the differences in our lives from external pressures. Haven’t you ever learned that? Just by losing weight I can tell you, until I decide I am going to lose weight I’m not going to lose weight. I can be told to lose weight. I can be encouraged to lose weight. I can have the quick weight loss commercial come on the radio and hear it and say; “that’s what you ought to do” and all of this stuff is just about waking me up but it has to be an internal choice in my life before any movement or progress is made in my own life. That is just the way it is. That is the reason why I am convinced that many times, many leaders get frustrated foolishly because they don’t see their people doing what they tell them. Well of course they are not, that is not the purpose. The purpose of leadership is never to make people do anything. In fact, I have discovered something and again I learned it from my kid. Every time I made Alexandra to clean her room, she has done a lousy job. It’s been halfhearted at best. There has been no joy in it at all, and she picks it up but just does the bare minimum to skate under my desires, that’s it. But if I exhort my children and explain to them and then in front of them model behavior in front of them, if I model the behavior in front of them, all of the sudden, as they start waking up to the wisdom of their own need to be mature and grown up, their behavior starts to change but that always comes from an internal work, precious friends. It is the reason why our Gospel lesson today is so powerful. Because our Gospel lesson today gives us what a human looks like when they have reduced the world to merely rule keeping. We find Jesus Christ in the synagogue on the Sabbath that is Saturday by the way. Synagogue on the Sabbath day and he is teaching the people and there is a woman there who has an infirmity, she is bent over, she can’t straighten up. We have seen people like that and Jesus noticing her and she has suffered from this for eighteen years. Jesus noticing her says to the woman; “woman, you are free from your infirmity: and he lays hands on her and she straightens up. Well immediately that confrontation with the miracle of Jesus Christ uncovers people’s hearts. You see dear ones that is exactly what happens when you come in contact when you really get to know Jesus Christ. When you really take your faith seriously. Watch this now folks, when you really take your faith serious and when it becomes more than a rote habit or more than just repeating old words for old words sake, when your faith actually becomes activated in your life, you confront Jesus Christ and when you confront Jesus Christ, your true heart will be revealed, that will happen every times. That’s why folks many times, let me change that, that’s why I try to avoid meeting Christ as often as I can because my true intentions and my true motivations show up. And so just like that, that happened again, Jesus does his miracle this woman straightens up. It is on the Sabbath and the ruler of the Sabbath is mad. And he tells the people, there are six days a week, you can come here and be healed by this healer, not on the Sabbath, we don’t do any work on the Sabbath that is against the rules. Well let me ask you this folks, do you think that was a motivating speech that that ruler of the synagogue left? Do you think that was something that really motived folks to say; “Boy, that is really exciting, thanks a lot for giving me that information.” No! It was a horrible letdown, talk about letting the air out of your balloon and depressing the whole room. And yet it was because this man only saw the rules and regulations as more important than the people. The people were not as important as making sure all the rules were followed. I have met people like that in my life and truth be told I’ve been those people sometimes in my life and yet at the heart of that sickness, at the heart of that blindness is a lack of awareness, a lack of being awake to what our true purpose is as believers in Jesus Christ. Some people believe that being a faithful follower of Jesus Christ is meaning that I am supposed to become more and more moral. That the purpose of being a Christian is to just be a good person and that is not true folks. There is a lot of things that will make you a good persons. The bookstores are packed full of self-help books that will help you organize yourself, help you achieve your goals, help you do all kinds of things. The self-help industry in this country is a multi-million dollar a year business but the reality is that is not the purpose of the Christian faith, to make you a good person. The purpose of the Christian faith isn’t to make you a smart person, it isn’t to make you a pretty person it isn’t to make you anything other than to be awake to being alive in Jesus Christ. What does it mean Father? Well it simply means this; it means that your true purpose will always be hid from you until you have been exhorted by the Gospel of Jesus Christ to wake up to who you really are and until that moment occurs in your life and as it continually to occur in your life. You find yourself confused about who you were meant to be. Consequentially, you will live your life based on lesser visions of who you should be. You will your life based on rules. You will your live based on your own pleasures. You will live your life based on your own desires or on your own wants or your own ideas and over and over again. You will find your life being rocked to sleep into the lethargy of miscommunication and wrong living. But the Gospel of Jesus Christ comes to us this morning in the person of our Lord Jesus Christ and he says to the woman with the infirmity; “Your infirmity is healed, straighten up” and he says to us this morning, “Do you want to know who you really are? Do you want to know what the real purpose of your life really is? Do you want to finally escape from the “making it up and you go along” and finally embrace the exhortation to wake up to what you were meant to be. If so, you are invited by the grace of God this morning, to embrace the fullness of the faith, the wisdom that has been preserved for twenty centuries in our Orthodox rhythm of life and to learn not about rules or regulations or stepping here and stepping there and making sure you follow that exhortation and that rule and that regulation. No! but an internal transformation that makes you desire to want to be with God and to be like Him. Brothers and sisters that is the real good news. It isn’t about imposing a set of rules and regulations to finally make you a good person. What a waste of time. Every good person I know makes mistakes. It is about finally waking up to the true purpose of your creation and that is to be by grace what Christ is by nature. Don’t settle for anything less, accept the invitation that the Holy Spirit gives you in the continually lovely and beautiful and wise rhythm of our Orthodox faith to embrace the lifestyle of knowing God. That is the promise you get this morning that is the good news. I pray you say yes.